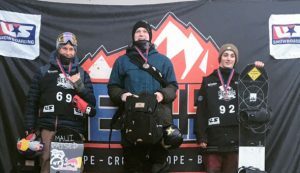 Waterville Valley, NH – It was a great week for U.S. Snowboarding at the Toyota U.S. Revolution Tour, with Kyle Mack (Bloomfield, Mich.) taking a win and Lyon Farrell (Haiku, Hawaii) taking second for the men and Nora Healey (Plymouth, N.H.) earning a win for the women. The Waterville Valley stop of the Rev Tour featured back-to-back slopestyle competitions, one on Thursday and one Friday. A chance to earn valuable FIS points as well as World Snowboard Tour points, the Revolution Tour is an important competition tour for elite up-and-coming athletes. Thursday’s competition faced weather challenges, and the course was abbreviated due to visibility. Athletes did well considering the conditions, laying down their best performances on one jump and three rails. Julianne O’Neill (Breckenridge, Colo.) won the event for the women, with Samm Denena of Canada in second and Taelor Mattingley (Sandy, Utah) third. Lukas Caye (Minneapolis, Minn.) was the winner for the men, with Luke Winkelmann (Blowing Rock, N.C.) in second and Kirk Teare (Essex, Vt.) in third. Friday’s weather was cold but clear, and competition organizers were able to offer a full course to the athletes. For the men, U.S. Snowboarding pro slopestyle team member Mack topped the field, rookie slopestyle team member Farrell was second and Caye scored his second podium of the week in third. For the women, rookie slopestyle team member Healey was first, Haliee Soderholm (Salt Lake City, Utah) was second and Anna Valentine (Sparta, N.J.) was third. The next stop of the Toyota U.S. Revolution Tour will be contested at Mammoth Mountain Feb. 7-12, with halfpipe, slopestyle and big air competitions.